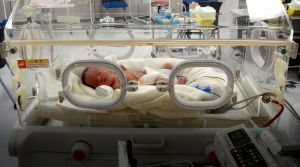 Precision medicine comes to the NICU. In August 2016, Amy Jaeger and Robert Supple became the parents of a daughter they named Rylee. Instead of spending their first months with their baby in blissful exhaustion, the new parents were faced with panic — their baby was shaking and spasming, and they didn’t know why. They took Rylee to a number of specialists, watching her undergo a seemingly endless number of tests. Then, as reported by Technology Review, Jaeger and Supple finally found answers after a neurologist recommended whole-genome sequencing, a method in which a patient’s entire genome (all of their DNA) is analyzed and evaluated. Just a week after Rylee’s blood was taken, her parents received a diagnosis — one that would have been fatal if left untreated. “This is part of a new wave of precision medicine,” Stephen Kingsmore, president, and CEO of Rady Children’s Institute for Genomic Medicine said to Technology Review. Quick genetic testing could allow doctors rapidly diagnose patients like Rylee. Genetic testing hasn’t always been this speedy, but new advancements at Rady have expedited the process a great deal. The technique is fairly simple: pieces of DNA are scanned in a sequencing machine which takes apart, analyzes, and then assembles nucleotides. With the help of a variety of tools, genetic mutations can then be identified. It took about 13 years to sequence the first human genome. Thanks to research and technological improvements, sequencing has progressively become a much quicker process. In fact, Rady researchers once challenged themselves (and their technology) to see just how fast the process could be: the result? A completed sequence in just 19.5 hours. While the effort was extraordinary, it was also very atypical — but the team hopes that one day, they might be able to at least whittle down the time sequencing to under 24 hours. If they could achieve that, the testing and the results would then fit into a single shift for a doctor in the intensive care unit. While it could have broader applications, for now, the team at Rady is focused on sequencing for infants and newborns because of the high risk of fatality. Very young children who are not properly diagnosed may be receiving improper treatment, or none at all, for potentially fatal conditions. From the time of birth, there could be a relatively short window for diagnosis if an infant is exhibiting abnormal symptoms. The sooner a child can be diagnosed, the sooner they can be treated — and their life potentially saved. While Rady’s sequencing method is still in the research stage, the team has sequenced 340 children so far. About one-third of those patients were diagnosed from the test and about two-thirds of those diagnosed received different treatment because of the test’s results. Not only did it lead to improved treatment for many of the children — it even saved some of their lives. This is not the only effort to use genetic testing to help babies and kids: doctors offer genetic testing for healthy babies as a supplement to other tests to see if they might have any underlying, less obvious conditions. But, in cases where babies are born with abnormal symptoms — but the reason is not immediately identified — rapid whole-genome sequencing could be truly life-saving.